On Friday, Israel’s Border Police used drones to drop tear gas canisters onto crowds of Palestinian protest marchers in Gaza, AFP first reported. A Border Police spokesman later confirmed the report, saying this was one of the first operational deployments of the technology. An estimated 30,000 Palestinians participated in demonstrations near the Gaza-Israel border on Friday, in what was dubbed the “Great March of Return.” The demonstrations were supported by Hamas, a militant Islamic movement which has governed the internal affairs of the Gaza Strip since 2005. Israel still controls Gaza’s borders and its airspace and sea access and has maintained a blockade severely limiting the movement of goods and people. The march was billed as a nonviolent action to mark the beginning of a weeks-long peaceful demonstration advocating for the right of Palestinian refugees to return to their lands in Israel. Israel had vowed to disperse the marchers, bolstering its forces on the borders, including the positioning of snipers and the preparing of crowd dispersal equipment. Some Palestinians threw rocks and Molotov cocktails toward the Israeli forces, and several people were founded to be armed with rifles. Israeli soldiers fired live bullets and rubber-coated steel pellets at Palestinians and deployed tear gas. By the end of the day, which fell on the first night of the Jewish holiday of Passover, 16 Palestinians were killed more than 1,400 were wounded, the Palestinian Health Ministry said. No Israelis were hurt. Friday’s events were the deadliest in the Israeli-Palestinian conflict since the 2014 Gaza War, in which 2,205 Palestinians and 71 Israelis were killed and 18,000 Palestinian homes were destroyed. 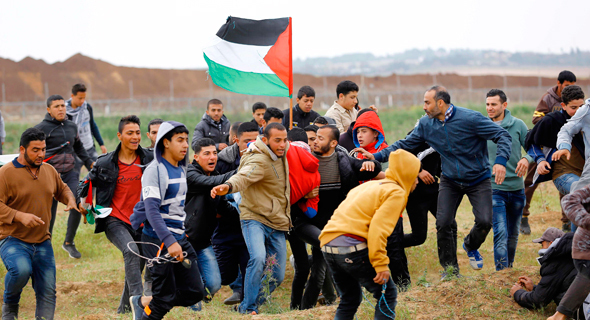 The protest is due to conclude on May 15, the day Palestinians commemorate the "Nakba" or "Catastrophe," marking the displacement of hundreds of thousands of Palestinians in the conflict surrounding the creation of Israel in 1948. Palestinian demands have long centered on the right of refugees and their descendants—some five million people—to reclaim possession of their land. Israel has rejected this demand, saying that an influx of Palestinians would undermine the country’s Jewish demographic majority. According to an AFP report, a drone dropped around ten gas canisters from a height of 10-20 meters during the Friday demonstration. A similar use of a drone was first reported in mid-March by Lebanese media outlet al-Mayadeen TV, which aired footage showing a drone, apparently operated by Israeli forces, dropping tear gas on Palestinian protesters near the Gaza-Israel border. A spokesman for the Israel Border Police at that time did not confirm the use of drones for the deployment of tear gas. Later that month, Border Police Deputy Commissioner Yaakov Shabtai told Israeli Channel 13 News about plans to deploy a new drone that could drop tear gas canisters during the March 30 demonstrations in Gaza. Israeli troops typically use hand-held cannons to shoot tear gas canisters. In October 2017, news outlet Israel Defense reported that Israeli defense contractor Elbit Systems Ltd. was granted a tender to supply the Israeli military with drones developed according to the specifications of the Administration for the Development of Weapons and Technological Infrastructure, a joint administrative body of the Israeli Ministry of Defense and the IDF.